Catherine De Orio, the embodiment of class, smarts and hard-work — and the best of Chicago. 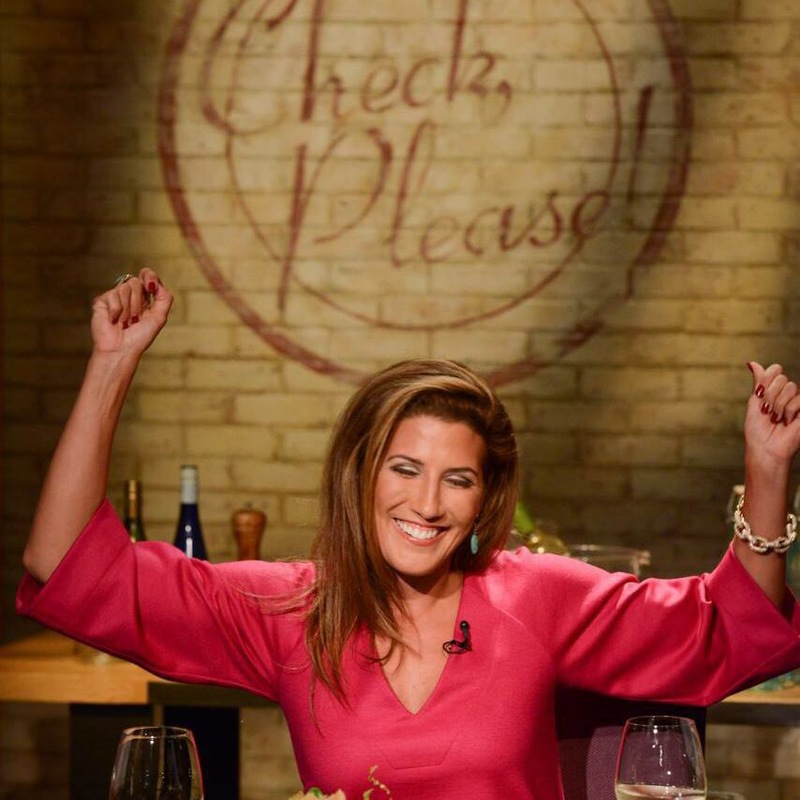 As the host of “Check, Please!” — the highest rated show on WTTW, it wouldn’t be surprising to find Catherine De Orio dining at a swanky Randolph Street restaurant. But while she may be at the newest and hottest, trend-setting spots where the chefs are true artists and treated as such, she is just as comfortable at “Johnny’s Beef” in Elmwood Park (where she grew up) or at “Ristorante Agostino Gustofino”, better known as Agostino’s, for some Italian comfort food similar to what her grandmother taught her to cook as a child. De Orio triple majored at the University of Wisconsin in art history, Italian language and literature, and political science and philosophy. She then worked at the National Gallery of Art as a researcher for world-renowned Leonardo Da Vinci scholar Dr. David Allen Brown. From there, she went to Italy on a Guggenheim Fellowship, then returned to Chicago to attend law school at Loyola. After working several years as an attorney, her career wasn’t fulfilling her passion, so she decided to attend culinary school (while still working as a litigator). De Orio began in the food arena as a “non-critical” writer for the online magazine “Eater” and the glossy print publication “Vegas” and as a self-employed culinary consultant and spokesperson for brands on television and events. She auditioned for “Check, Please!,” beating out more than 900 others to become the first host from the Chicago area. De Orio, who will be going into the third year of her tenure as host of the show (it tapes in the summer months) recently also took a position at her culinary school alma matter — Kendall College — as the executive director of the Kendall College Trust, which hands out scholarships to potential students. She chatted with The Chicago Ambassador about her career, her outlook for the future and a few of her guilty pleasures (candy corn, anyone?). CA) I know you can’t name specific restaurants, but what are your favorite types of places? DE ORIO) I’m open to all kinds of dining experiences, which is part of the reason I went into this career path. For me, I like things that are warm and comforting, where I can go with my friends and have a good time. I think food is something that brings people together, and that’s probably from my Italian background and spending a lot of time with my family and friends. For me, because of how I grew up, I tend to be drawn to places that have a very warm feeling to them. Not too froofie, just kind of about having a good time and enjoying yourself. I should make it clear that I also very much like going to fine dining restaurants, and having this experience where the chef is an artist and showcases his skills. CA) Are you a “regular” anywhere? DE ORIO) I’m very hesitant to ever say that. There are definitely places that I go to a lot but it’s not fair to play favorites. …One of the place where I spent a lot of time going to over the years is Agostino’s (Ristorante Agostino Gustofino). I’ve been going there since I was a little girl with my family. When I graduated from college we went there, when I graduated from law school we went there, so that would be the style of a place where someone might call me a regular at. CA) A couple years ago, you beat out more than 900 applicants to get the host position at “Check, Please!” — What was it that inspired you to try out? DE ORIO) I had been in the food TV business almost ten years so it wasn’t really a huge change for me. It was a more steady position. I had been on shows all over the country, but I never had my own show. I always loved “Check, Please!” I’ve watched it since Amanda Puck, the original host, was hosting it. I was still a lawyer and she was hosting the show and now years later, I had moved into the food industry and always loved the show. It was a job I wanted before I was even in the industry, so I threw my hat into the ring, along with everybody else in Chicago, I think. CA) When you got the job, you received a one-year contract. You’ve now completed two years. What’s your current contract situation? DE ORIO) It’s reviewed year to year, so now we are talking about season three. CA) Do you see yourself sticking around for ten years like previous host Alpana Singh — or closer to first host Amanda Puck’s two year tenure (which you’ve just completed)? DE ORIO) I love “Check, Please!” so I’ll stay as long as they’ll have me. CA) Have you met or had any conversations with either one of them about the show? DE ORIO) Not really. I see them frequently, and Amanda is a good friend of mine, we go out to dinner but it’s not really what we talk about. We all kind of had our own time. The show has evolved. Even though the format’s the same, the dining world has changed. They both have their unique personalities and styles. They both did give me advice before I got the job, which was that things will change if you get the job. CA) How have things changed for you? Has it changed your life? DE ORIO) I’d say yes and no. I’m still doing food TV so it hasn’t changed my day to day rundown. People recognize me when I’m out now and that wasn’t something that necessarily happened, so in that way, yes. People recognize me mostly in restaurants. CA) Just yesterday on Facebook, Alpana posted that “The loyalty of Check, Please! fans never ceases to amaze me. I’ve been gone for 2+ years & I still get love & compliments.” Has your reception been welcoming since you’ve been hosting? DE ORIO) Yeah, absolutely. The “Check, Please!” audience is great. They love the show. Not everybody is going to like me and I’m aware of that. Not everyone will like every host but I have to say that I’ve had an incredibly positive experience. CA) You attended the University of Wisconsin, an infamous party school, but triple majored (in art history, Italian language and literature, and political science and philosophy) Was there a time when someone could find you at the bars there on a Saturday watching the Badgers? DE ORIO) I’d be lying if I said no. I was a pretty serious student, for sure. I triple majored, I worked three jobs, I headed up three different organizations, I was very active. But at the same time, I like to have fun. I am very close with all of my friends from college, even the ones that don’t live in Chicago. So, I had more than my fair share of times at Paul’s Club, which was my favorite bar when I was there. My girlfriends and I would also go to Kollege Klub to watch games and play darts. There was a place that is now gone, sadly, called The Flamingo. We used to go there all the time. CA) You were also known for throwing lavish dinner and wine pairing parties in college (and later also). How did that start, where did you get that from? DE ORIO) I grew up cooking with my grandmother, my Italian grandmother. So, I’ve always enjoyed cooking in general. And then when I was in high school, I would cook for my boyfriend. There is something really wonderful about feeding people, nourishing people. I’ve always kind of enjoyed that. Then when I went to college, I found that a lot of people like people who know how to cook. You end up making a lot of friends if you feed people. The thing is in college is that one, I like to cook. It was fun for me. And a lot of your friends don’t have a lot of money in college, so trying to get your friends to go out to dinner, that really wasn’t part of our college experience. We were all saving money for beer. It was really fun to have everyone over and everyone had fun. It was a great way to get everyone together and there was no stress about spending too much money. There was a group of guys who I was really good friends with who lived together in this house, and we had this deal. I would come over and cook, they’d all pitch in for groceries and I’d cook. I’d go to the store and buy everything then I’d come to their house and make this big meal, we’d all eat together and then they had to clean. So, I got to do the best part. I got to cook, make everyone happy and then I’d leave. It was the best. CA) It doesn’t sound like a bad deal for them either. DE ORIO) (Laughs) Yeah, exactly — it wasn’t. It was fun. I got to try out all kinds of recipes. It was really fun. CA) You love to cook — yet friends have said you know about almost every restaurant in Chicago, if not the country. How much do you go out to eat versus cooking at home? DE ORIO) Not nearly as much as I would like to. It’s hard because in order to do my job well, I need to keep up with what’s happening. Right now we aren’t shooting for “Check, Please!” We shoot during the summer and early fall and I go to about 40 different restaurants in the course of three months, so I end up eating out a lot. CA) You go to all the restaurants that the guests recommend? DE ORIO) Yes, I go to all the restaurants that we feature on the show. So, I’m going to those, plus I’m trying to have a normal life where I see my friends on their birthdays and my husband on a date night, and there’s restaurants that I go to because I’m going to write about them, so I find myself out quite a bit. It’s a good problem to have but because of that, there is only so much time. There are only so many meals you’re going to eat, so I don’t cook at home as much as I’d like to. CA) Your father is Italian and your mother is Lithuanian and you grew up in Elmwood Park. Do you still have ties to the neighborhood? DE ORIO) My whole family still lives there. I’m there all the time visiting cousins, I’m out there quite a bit. CA) You have an artsy side (as evidenced by the art history and Italian language majors) and a more analytical side — as evidenced by the poly science and law degrees — Do you identify more with one side or the other? DE ORIO) Am I more left-brained or right-brained? DE ORIO) Here’s the thing. I really enjoy utilizing both sides and I kind of have found the perfect balance right now. There’s a creative element to the TV side and the writing that I do about food. I recently took a position with the Kendal College Trust, which is a charitable arm of Kendall College. As an executive director that’s handling a trust, I’m definitely utilizing more of that side. So I kind of found this happy marriage where the two positions I hold really equally satisfy my creative and analytical side. I feel very lucky. CA) You started attending Kendall but didn’t tell your parents for a while — why was that? DE ORIO) My parents are pretty traditional. They just want the best for me, so I understand it. I’m sure they thought ‘My daughter’s a lawyer, she’ll be fine. She’ll always be able to take care of herself, she’ll always have a job.’ I just did not tell them. It was a hard enough choice for me to make, so it was the last thing I needed was to hear otherwise, especially from people whose opinions I really looked at. So, had my parents been like ‘don’t go to culinary school’ I might not have been able to handle it. I might have been a career lawyer. CA) Obviously you couldn’t have been extremely happy being a lawyer. What sparked the career change? DE ORIO) I’ve always had a creative background. My first job out of college was working for the National Gallery of Art in Washington, DC and from there I moved to the Guggenheim Museum in Venice, Italy. So I did museum work, and that’s what I was planning to do. Without getting into the whole thing, I realized there were certain shortcomings at those positions and also a scarcity of those positions that made me think that maybe I should broaden what I can do. So I went to law school to be a lawyer in the arts, to work in the arts, make a better living, get paid a lot more, be more secure, with the specific goal to go back into the arts as soon as I was done. I ended up meeting my husband at the very tail end of law school. He asked me to not move to New York, which is where all the jobs that I would have wanted are. We stayed in Chicago and are about to celebrate our 10-year anniversary, so I guess it worked out okay. (laughs). CA) It was interesting to me that you attended Kendall, but your goal was never to become a chef and open a restaurant. DE ORIO) My goal was to be a caterer and event planner. I ended up becoming a culinary consultant because that job just kind of found me. CA) And you did that on your own — you worked for yourself doing that? CA) Are you still doing any consultant or spokesperson work? DE OREO) When I took the “Check, Please!” job I stopped doing them for various reasons. Some of it was because of travel, I had to travel a lot. So, I really wanted to focus on “Check, Please!” Even though I did TV work in the past (as a spokesperson) it’s very different. Being a guest is very different than being a host of a show. You’re a pacesetter when you’re a host and when you’re a guest you’re just kinda keeping the pace with whoever is setting it. That was my biggest transition, learning that. CA) One of the companies you worked for in that capacity was Sara Lee, which owns Ballpark Hot Dogs. Somehow, I can’t picture you wolfing down a dog. Are you a fan of hot dogs? DE ORIO) Oh my God, Gene and Jude’s are my favorite! People think that I’m a lot more dainty than I am, but hey, I just like good food. CA) Is there a food that’s like a guilty pleasure or something people would be shocked to see you eating? DE ORIO) There’s a few things. I like fried pickles. I really like candy corn, which I know is really gross. Candy corn and Peeps. I know it’s one of the most disgusting things, it’s pure sugar and pure chemicals, all high fructose corn syrup and coloring. I’m very open to trying anything. Most people who know me, know that. The only rule I have is whatever I eat has to be part of some culture’s culinary repertoire. I’m not going to eat bugs just to eat bugs. If you can find somewhere where it’s what they eat culturally, I will try it. I might not like it, but I will try it. CA) Some people may wonder how you go out to eat so much and do not weigh 300 pounds. Is it just a case of eating in moderation? DE ORIO) I’m either being very, very good at watching what I’m eating, or I’m being very, very bad. I think they kind of even each other out. My thing really is that I never want to look at food as something that I should feel guilty about. If I go out and I’m eating something, I enjoy it, I’m happy about it, but I do watch. And I work out a lot. I enjoy working out so I do it every day. I lift weights, I run, whatever. I went to Hawaii to learn to surf, I do a lot. And If I have to miss a workout because I’m sick or something, it makes me upset because I enjoy it a lot. CA) You also wrote for many publications. You’ve been described as a very hard worker, someone who is extremely smart and very driven. You’ve also been called someone who is extremely well-rounded and who can relate to anyone and is very nice. However, I’ve read that you claim you are your harshest critic. What do you think you need to improve on? CA) What hobbies or interests do you have outside of the food realm? DE ORIO) I love fashion, I like to travel. I like to read but haven’t had much time. One of my resolutions this year is to get back to reading. CA) Fashion is something I wanted to ask you about. You’ve been described as someone who is always dressed to the nines and have said you don’t even own a pair of sweatpants. Does that come from your parents? DE ORIO) My parents dress well. I remember growing up wearing a pair of shorts and my mother was like ‘You really shouldn’t go out like that, you never know who you’ll meet.’ So, as I got older I started taking my mom’s advice. I also lived in Italy for more than three years and there is a definite care that the Italians make in their appearance when they go out — even when they are home. Maybe it’s that European sensibility, but having lived in Italy for a few years and Paris as well, things really rubbed off on me. I’d see these women, they were so elegant. They always looked nice and I just thought that’s what I want to be like. It’s not about spending a lot of money, it’s about buying something of nice quality and taking care of it, taking care of yourself, making sure your makeup is on, that you’re groomed. I feel when you do that it just translates into the way you treat everything else in your life. It’s a nice starting point. You take care of yourself and then basically you take care of everything else in your life a little better. CA) Where do you see yourself in five years? DE ORIO) I’d like to be doing TV. I would maybe do another show in addition to “Check, Please!” with travel and food. I’m very interested in cultures and the history of cuisine. I’d love to do something like that and maybe get into producing. I’m well aware that the talent side of the business is short lived and I would like to use the business side of my brain and develop some shows on my own or in conjunction with someone else. CA) Does it mean anything special to you that unlike Puck (who grew up on Staten Island) and Singh (California) , you are the first host of “Check,Please!” to have grown up in the Chicago area? DE ORIO) I think Alpana and Amanda brought a different perspective. But having grown up here, and always being into food and dining out, I think I bring a little more context to how the landscape has changed in the dining world in Chicago. I think we all bring something a little different. CA) Where would you say Chicago ranks as a food city? DE ORIO) Number one, of course! I say that, not because I host a dining show here but because I’ve travelled all over. I truly believe that Chicago is the center of America. I think what is happening here is very exciting. I think the chefs here take more risks than you see on the coasts and certainly what you see in Vegas. I think New York is starting to step it up again. For so long in New York and LA, and Vegas, it was too expensive to take risks there. To open a restaurant there, it’s so costly and anyone investing in your restaurant isn’t going to be willing to take that risk. I think that might be changing, but because of that, Chicago has these restaurants like Alinea starting here… To watch our city have a community that’s so supportive of this, I truly feel that we are the number one city in the world right now. In the world.